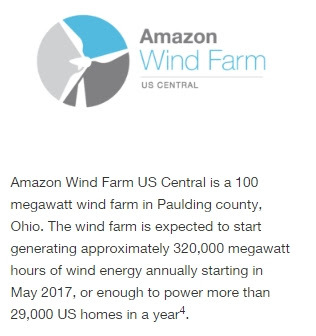 Just to confuse, Amazon calls their AWS Ohio Region (yesterday's post) part of "US East", but calls their wind farm in Ohio's Paulding county "US Central". And it's located on the west side of Ohio. For clean energy, they can call it whatever they like and put it wherever they like. The 100 megawatt wind farm is expected to start generating about 320,000 megawatt hours of energy annually, starting in May 2017, enough for 29,000+ households.